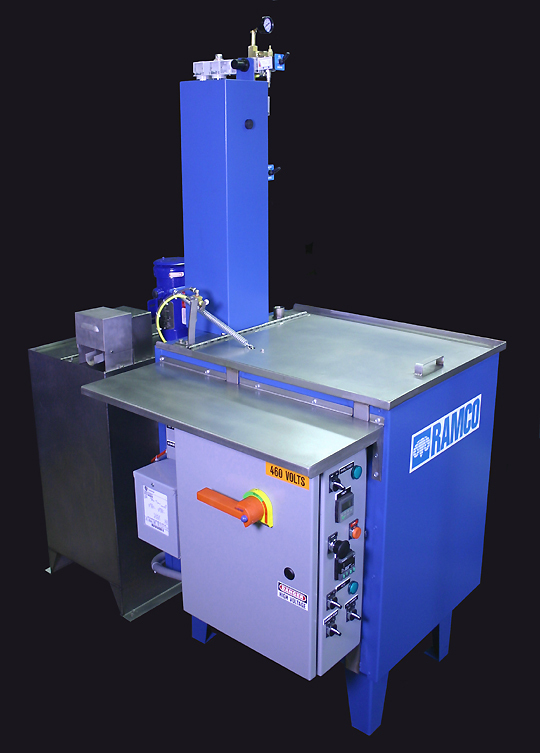 The MK16 and MK24 are compact immersion parts washer ideally suited for a multitude of applications. The processing chamber has its own transport elevator to take the work into and out of solution. The operator simply loads the platform and starts the cycle. The elevator automatically descends into solution and begins to oscillate. When complete the elevator ascends from solution with the basket(s). Leaning over the tank to manually place baskets in and out of solution is eliminated. 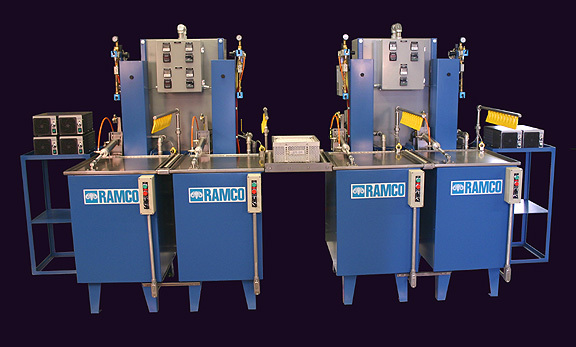 The system includes the patented RAMCO NFPA Floating Cylinder and a standard oscillation package using all NFPA components. 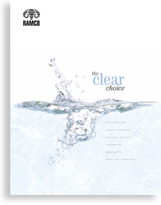 MK16 – This application includes a SurfaceSweep™ Oil Removal System. 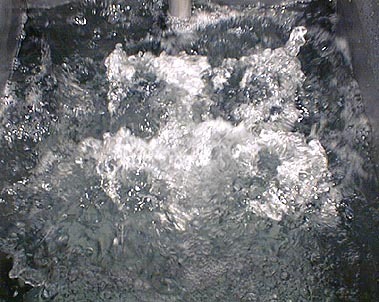 SurfaceSweep™ is a comprehensive method (using a lateral flow sweep header and large overflow dam) for removing floating oils from the surface of immersion washers and into a remote quiet tank for separation. 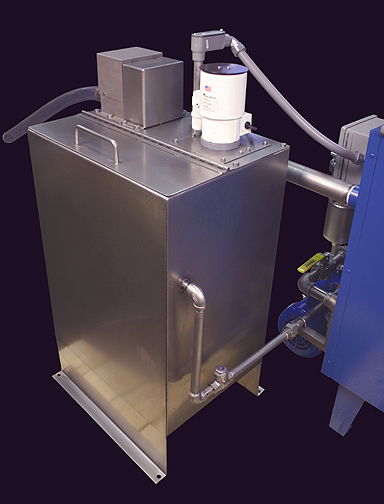 Our latest version (Model OR6A – see below) is both a decanting and skimming system. It is well priced and an excellent value (including all stainless steel piping and return pump and a stainless steel deep belt skimmer). The system is designed to trap oil in an offset polypropylene quiet tank. The quiet tank has its own stainless steel pump to discharge oil free detergent through a sweep header strategically located in the washing chamber. The reflux of fresh solution creates lateral flow across the surface of the bath. The flow directs surface oil into the large overflow dam built into the opposite wall of the washing chamber. Oil-detergent emulsions further separate in the quiet tank and the oil settles to the surface. A stainless steel belt skimmer automatically removes the accumulated oil into a separate collection container. The system prevents floating oil from redepositing onto cleaned parts. It is designed to handle oil that will split from modern detegents. Other options available for the MK16 and MK24 include electropolished stainless steel baskets, platform roller conveyor sections, power operated cover, a modular small parts rotator, ultrasonics, a matching hot air knife dryer and a pass through RamTough automation system. These systems are ideal for a small cell and easily abut to make multi-station lines.